Saving a buck or two is something I love to do, especially since I found out we spend 47% of our income on food! Yikes! Is it me or is food becoming more expensive? Add vegetarian meals to your weekly dinners. Rotating out a steak and potatoes dish for let’s say a pasta dish is a sure way to save a buck or two. We used to spend $40 on meat a week – shew – but as we learned to cut back and enjoy vegetable soups, panini’s and pasta dishes, we have really saved some money! Beans, beans, beans. Beans are not only a great source of protein but a cheap one at that! Canned beans can be purchased at our store for $.79! Add them to your soups, salads and main dishes to save money on meat. Enjoy soups. With the cold weather setting in, soups are a perfect way to not only warm your body but your budget as well. Vegetable, chicken noodle and tomato soups are some budget-friendly ideas to make. Enjoy leftovers. Nothing saves money like eating leftovers! Don’t waste and throw away your food or money! Know your budget. This is one of my favorite tips – If working on a budget, we must first define what that budget is. What is affordable for your family to work with. Save receipts for a month and add up the overall cost of food. Then break down where you may spend the most money. If you can make something from scratch, it may be worth it. For example, we used to purchase 3 loafs of bread a week and unfortunately, I always stared at the bread maker. After reviewing our budget, I now use it very often. This has saved us dollars! Where can you improve on? 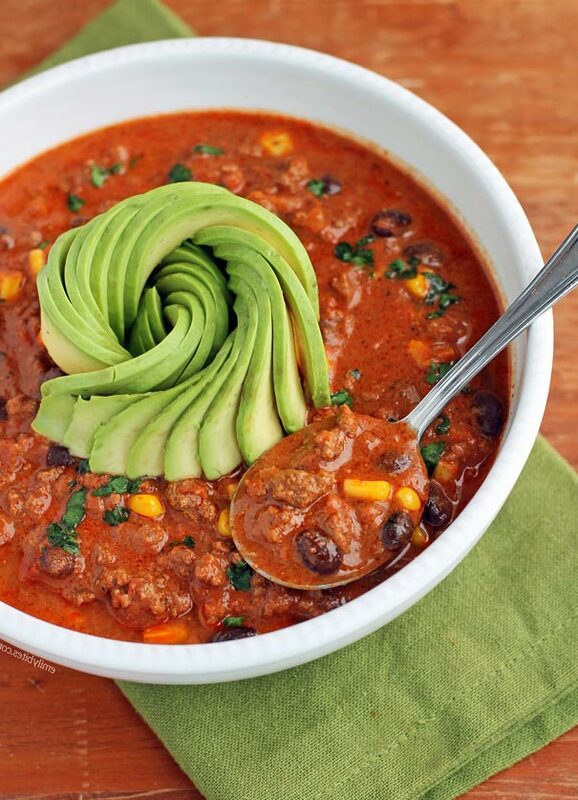 I choose to make Beef Taco Soup this week since it uses only a handful of ingredients. Twice a week, I make dishes with meat and I also make sure the meat is high-quality and organic. You may step back and say “HELLO, organic meat is not cheap,” but if you know where to shop you can find a good deal. It may just require some detective work or purchasing through an online reputable place. Although we are on a budget, I still have high standards for my food. Our local store sells organic beef for $5.99, which ironically, is the same price as the conventional. The total for this recipe cost me roughly $11.50 and serves 4 making this LESS than a $3 per serving meal! In a large skillet over medium heat, add olive oil and cook meat until no longer pink. Remove from skillet and put on a plate. Add tomatoes and broth until desired consistency is reached. I used less than a whole can of broth. Bring to a boil and simmer for 30-45 minutes. Optional, serve with shredded cheese. Note 1: Instead of chili powder and cumin, you can always substitute a taco seasoning pack.